On a snowy, winter’s day, Henry was full of cheer, He had a special train to pull, Which ran just once a year. Winter has arrived on Sodor, and Henry has a special train to pull – full of presents for all the children! 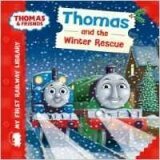 But the snow is falling quickly, and soon Henry is stuck on the tracks! Which engine will come to his rescue? With a young rhyming text and bright colourful pages this is the perfect first Thomas book.